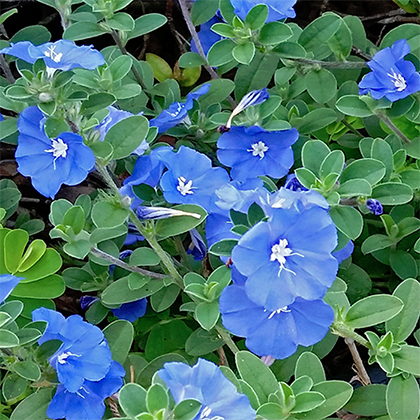 Blue Daze - Brad's Bedding Plants, Inc.
Evolvulus, or Blue daze, is evergreen subshrub that grows in a low, spreading mound, up to 2-3 feet in diameter, but no more than 1 feet tall. Evolvulus grows well in full sun to poor sandy soils that are well drained. It cannot tolerate wet soils at all, and very rainy periods or overwater will cause fungus problems and lead to premature death.